Fairfax Media journalists have written to the company's board and shareholders about management's plans to cut 1-in-4 jobs from metropolitan newsrooms. The journalists are taking seven days of industrial action to protest management's proposed restructure that would see the loss of 25 per cent of jobs lost from the company's metropolitan newsrooms - cutting 125 journalists out of an editorial staff of 500 in Sydney and Melbourne. The journalists' open letter, addressed to the company's shareholders and board members, sets out the journalists' case for the company to act smarter by investing in the company's quality journalism rather than undermining the company's products by making yet more radical cost-savings cuts by forcing redundancies on editorial staff. 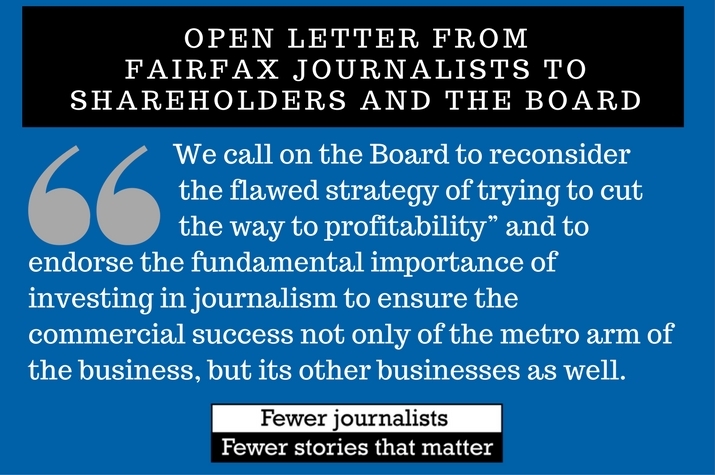 It says the Fairfax board of directors' strategy of "cutting the way to profitability" is flawed. The letter makes the point that Fairfax businesses flourish because of the company's journalism and that, because of this, Fairfax should invest in its journalism because it makes sound business sense. The letter cites the plan to float the Domain business as an example. We are writing to you to make the case for strong continuing investment in Fairfax Media's quality journalism, rather than seeing yet another radical cut to the company's metropolitan newsrooms. It goes without saying that as the oldest media company in Australia, and the publisher of the two great quality mastheads in Australia's biggest cities, Fairfax Media has made an incalculable contribution to the public good, the effective functioning of our institutions and national discourse in this country. All parts of the company's business, and especially perhaps Domain, draw an enormous commercial advantage from their association with our powerful, reputable and award-winning mastheads. As you would also be aware, the business model for Fairfax has historically relied on advertising to fund our journalism, a task which was easily achieved in the past when print media had a virtual monopoly on classified advertising. But in the digital age this advantage has been eroded by new platforms with enormous reach which adopt the low-road approach of aggregating the news produced by others, rather than investing in their own news-gathering. Today more people than ever before read and watch Fairfax Media's award-winning and independent journalism. They know they can trust us - and nurturing and serving that trust is our key point of difference, the very best way to future-proof our business. Advertising revenue associated with that audience has thus far provided diminished returns in the intensely competitive on-line environment. Instead Fairfax Meda has launched new businesses, including Domain, Stan, events and many more, which need to flourish for Fairfax investors to continue to benefit. We believe its demonstrably the case that these businesses will succeed largely BECAUSE of, not despite, their association with the tremendous journalism at such great titles as the Age, The Australian Financial Review and the Sydney Morning Herald. It thus makes sense to reinvest a portion of that success in our news-rooms, not necessarily out of a sense of civic duty (though that counts too) but because it makes sound business sense. Fairfax will only prosper in the 21st century if it nourishes the journalism that delivers its valuable audiences and sustains its storied mastheads. We also believe that if Domain is to be floated, it is only fair to Fairfax shareholders that the deals being made for promotion of that part of the business by our mastheads be made on just commercial terms. For full transparency, this should be done in advance of any investment outreach. This would make explicit the link that already exists between Fairfax's journalism and Domain's commercial success. We therefore call on the Board to reconsider the flawed strategy of trying to "cut the way to profitability" and to endorse the fundamental importance of investing in journalism to ensure the commercial success not only of the metro arm of the business, but its other businesses as well. We thank you for taking this into consideration and look forward to your support."